If you don't know what colour of flower to use to express love, joy, happiness, encouragement or even mourning, or which ones are most frequently ordered from www.fleurop.at, you'll find some ideas here. Remember that flowers come from nature and are never pure blue, yellow, orange, red, etc., but give the desired overall impression through a variety of nuanced shades together. Which colour matches what person? Of course it's ideal if you know the favourite colour of the person to whom you're making the gift. However, if you don't, you will find a brief summary of the different colours here. A click on the colour reveals more details of its symbolism and tips on the occasions when it could be appropriate - and for whom. The colour blue is associated with heaven, the sky, clarity, devotion and harmony. Blue has a comfortable, calming effect expressing likeability and contentment. 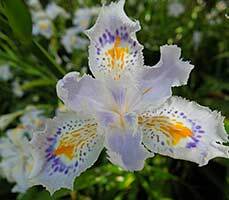 Because there are relatively few blue flowers, they are normally combined with other colours: with white, blue flowers look fresh, light and stylish - with yellow, they're more summery and sunny. In other words: blue flowers (e. g. blue hydrangeas, cornflowers) are a piece of heaven and are appropriate, for example, as a cure for wanderlust or as a sign of undying devotion. Blue and white in combination are reminiscent of feathery clouds in a blue sky and are a good way to bring a bit of a fresh breeze into someone's life. And blue and yellow variations are like sky and sunshine and are appropriate as a friendly, sunny gesture. From routine to rainbow? You'll find the shop HERE. Bright yellow is associated with the sun and sunshine. This bright and cheerful colour therefore stands for optimism, interest, curiosity, openness, intuition, inspiration and vitality. Hindu women wear bright yellow saris at the beginning of the Hindu solar year because yellow symbolises life, light, truth and immortality. 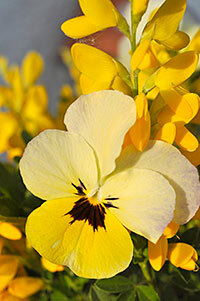 In other words: yellow flowers have the effect of a dose of sunshine. They cheer people up and have an enlivening and inspiring effect. They are just right for frank people and on occasions when you want to give optimism and strength. They are also often used in the everyday business world. Golden yellow is associated with the power of the sun and with gold. This warm colour therefore stands for wealth and happiness. In China, it is also assigned to the masculine yang principle: active creative energy. 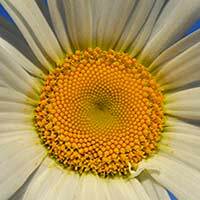 In other words: golden yellow flowers have a more subtle effect than bright yellow. They are like pleasantly warming sunbeams and are suitable for serene people to whom you want to wish happiness and contentment. They are also appropriate for congratulations and are popular in the everyday business world. Green occurs frequently in nature. This colour is therefore associated with life and growth and, metaphorically, with hope and confidence. Green flowers are rarely to be found; luckily, however, not just every flower but also every bouquet comes with quite a large amount of green. In other words: with every flower and every bouquet you give a piece of nature that means life, hope and confidence simultaneously. We can all do with that! Pale blue appears refreshing and is considered to be the colour of creative expression and idealism. This colour is associated with intuition and empathy and with daydreaming. At the same time, it is thought to be the ideal colour for the birth of a little boy. Up to the start of World War I, pink was the colour attributed to men. However, when blue naval uniforms and blue overalls were everywhere during and after the hostilities, blue was suddenly associated with men and pale blue with little boys. In other words: pale blue flowers are not just appropriate for the birth of a boy. They are also suitable for idealistic, intuitive, creative people and daydreamers. 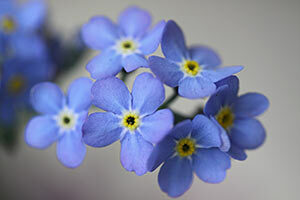 Receiving pale blue flowers also helps a person to show emotion and strengthen his ability to communicate. The colour orange stands for happiness and youth, but also for joy and maturity. Psychologically speaking, it is considered to be mood lifting and stimulating and is associated with desire. In depth psychology, orange stands for communication and the wish for unity. 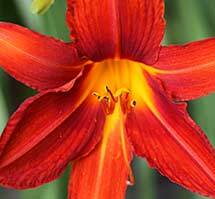 The colour is also said to have an enlivening and optimistic effect. In other words: orange flowers can be described as THE perfect pick-me-up. They come across as warm-hearted and communicative and are basically appropriate on any occasion, even for sick people and as a little gesture in everyday corporate life. The true purple dye obtained from the murex snail is one of the most expensive dyes in the world. In ancient Rome, purple was reserved for the Emperor's toga and the borders of senators' robes. 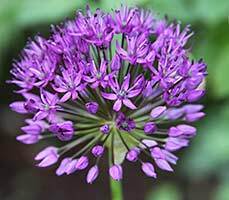 Purple was still reserved for emperors and kings as late as the Early and High Middle Ages when the main suppliers of the sought-after purple products were based in the city of Constantinople. This colour therefore stands for nobility and dignity. 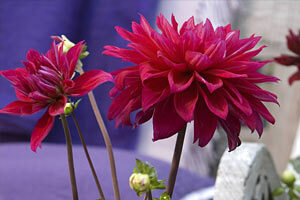 In other words: purple flowers are appropriate for gifts intended to make an impression. Because there's truth in the old saying: noblesse oblige! Pink is versatile. It stands for gentleness, sensitivity, affection and restraint. Pink is also known as the colour of the heart because the emotions concerned may be altruistic ones such as sympathy and devotion. What's more, pink looks delicate and soft, which is why the colour is also associated with femininity today. That was not always the case. Pink, as the "little red" colour, used to be attributed to men. That changed after World War I because blue naval uniforms, blue overalls, etc., were everywhere. Blue was then suddenly the men's colour, and in contrast pink became the colour of femininity. In other words: pink flowers are appropriate when a little girl is born, when you feel the first butterflies in your tummy or when you don't just want to surprise someone with flowers but would like to give them a piece of your heart and show that you are genuinely close to them. The dynamic colour red stands for passion, eroticism and love, zest for life, self-confidence, strength and activity. 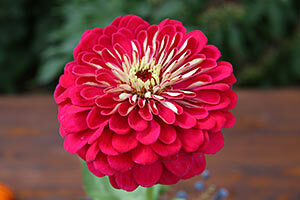 However, the colour red also stands for beauty and joy. The Russian terms for "red" and "beautiful" come from the same root, while in China red is the symbol of joy and is in evidence whenever festivities take place. The red carpet rolled out to receive celebrities is also a sign of joy and festivity. 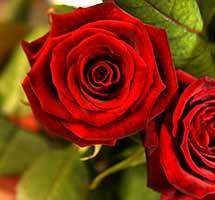 In other words: red flowers are not only right for smitten Romeos and passionate Juliets, but also for decisive, strong-willed, active people with a zest for life or those who need a little push in that direction. Violet is considered to be the colour of the mind and mysticism. It also stands for creativity and is thought to be imaginative and out of the ordinary. Violet is recommended in colour consultancy to express self-confidence and individuality and also when diplomacy is indicated. Furthermore, violet is said to have a charming and seductive effect. 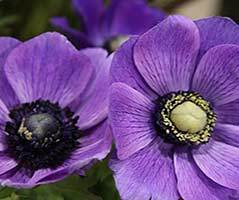 In other words: violet flowers are charming, seductive and creative. They are perfect for individualists or people who love anything unusual. What does white make you think of: light, snow or innocence? Mourning and death? White can be associated with many things because it is spiritual and noble. In other words: this colour stands for purity, perfection, innocence, wisdom, virtue, sympathy, love of truth, beginnings and endings. White flowers are therefore appropriate for births, marriages, New Year, turning points in life, and also mourning and consolation. 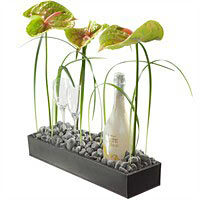 They also represent total lifestyle because they look sophisticated and go with a very wide range of interior decors. 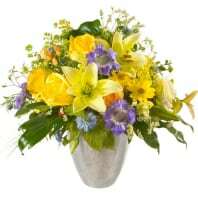 Take a bit of sky, sunshine, happiness and hope, a little encouragement, zest for life and charm, and have all ingredients mixed by an expert to create a magnificent bouquet or arrangement. Seriously: mixed bouquets have the effect of a sparkling cocktail of the emotions, because the various colours express different feelings. Maybe that's why they're so popular and are ordered frequently even as business gifts. Tip: men like them too.